It’s embarrassing enough that we left out some of the United States’ best ‘crossers from our Amgen Tour of California CX Classification. But what is even more embarrassing is when one of the guys we omitted calls us on it. * After posting yesterday’s update we received the Tweet at the top of the page from Christopher Jones (Team Type 1). 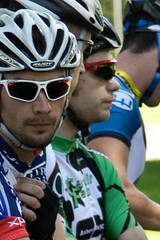 You may know Chris from, among others, his 2009 cyclocross podium appearances at Cross Vegas, NACT Gloucester and both days of the Providence Cyclocross Festival. In fact, Chris ended 2009 with 10 top 10 finishes in UCI cyclocross races clearly making him eligible for the AToC ‘Cross classification. What makes our omission even worse is that Mr. Jonez is killing it on the roads of Cali currently sitting 17th, 2:05 off the lead. We also overlooked the brothers Jacques-Maynes in our haste. Ben and Andy both have exceptional CX results and easily meet the JPows “podiumed in a UCI event” criteria. Ben Jacques-Maynes (Bissell) currently sits 41st and Andy Jacques-Maynes (Bissell) is 78th at this year’s AToC. With the recent hubbub over USA Cycling’s proposal to use a time trial to determine starting positions at Cyclocross Nationals, today’s stage will be a good look at how the ‘cross specialists do in the discipline. Maybe these guys will give us some insight on how to shoulder our bikes whilst wearing those funny looking helmets. And now for the updated and corrected standings. No change at the top as Sagan continues flying the flag for the cyclocross troops by winning stages and the points jersey. Dude has some power in those legs, no doubt. We’ve also included the climbers and young guns in our round up to drive home the fact that the CX guys can do it all. *It’s actually pretty freakin’ cool that Chris saw the post. And like a child, we are learning the wrong lesson from this. Screw up and you get attention!